View this training via WEBCAST on your device at a place and time convenient to you (expected to be ready to watch near late October). 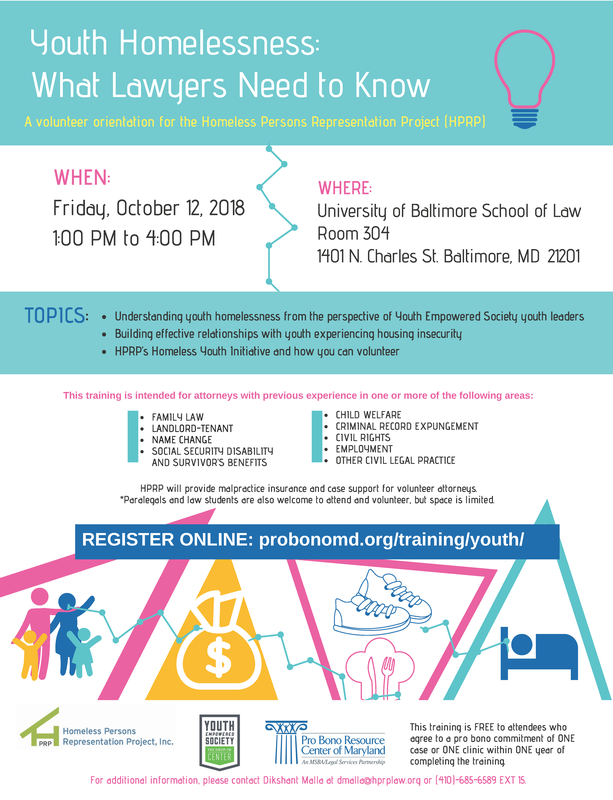 This training provides an understanding of youth homelessness (local statistics, causes, experiences of youth), cultural competency for working with youth experiencing homelessness, and an overview of HPRP’s Homeless Youth Legal Network pro bono initiative. Attorneys taking the training will need experience in one or more of these areas: child custody, identity theft, consumer debt, name and gender changes, connecting with foster care, or private landlord-tenant law. Registration questions? Contact Kiah Pierre at kpierre@probonomd.org. Questions about the Homeless Youth Initiative? Contact Dikshant Malla at dmalla@hprplaw.org.